As a blogger or content writer we know what it takes to create an awesome article on any topic. We invested our time, our creativity and then expressed our understanding and experience in words in that article. But after all this effort, if no one is reading that good article, then it is completely waste and heartbreaking. Most of us went through these kinds of scenario. I am perfect example, but not now days. In my opinion giving more time to promote that article is necessary. It means if having 40% – 60% ratio in writing – promoting the article. Here in this article I will show you what you need to do just after publishing your content. 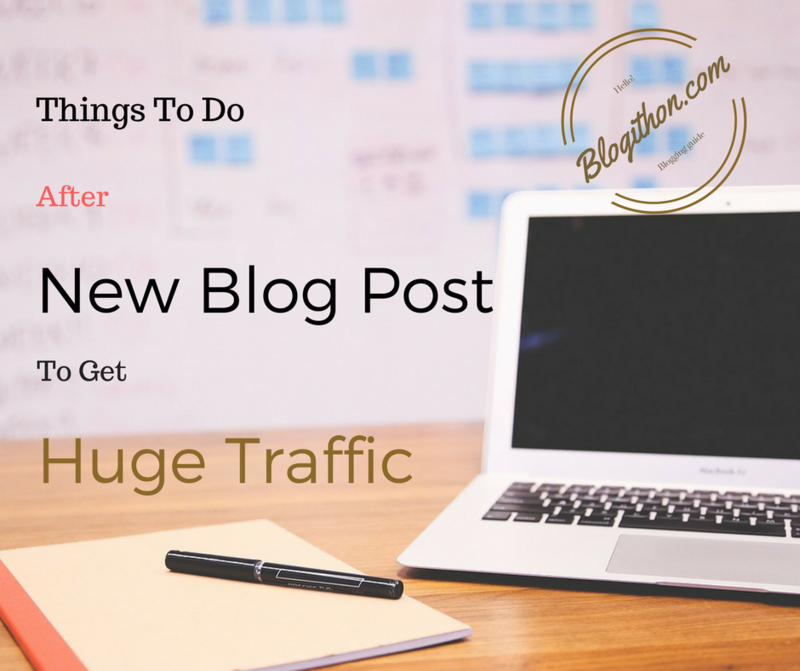 Follow these steps and you will find a huge amount of traffic and you will see your hard work is recognized and loved by large number of people. More love from your readers, more happiness for you, more health for your blog. In fact, I did the same thing and it might be case that you are reading this article due to these promotion efforts. You have seen on countless blogs, in their social media buttons area, this phrase. That is entirely true. Social media is a very powerful platform. If anyone says that now days all internet people are on the social media, then it’s that person is correct. Sharing your content on Facebook, Twitter, LinkedIn and other social media platforms can drive unimaginable amount of traffic to your blog. Important thing is to make correct strategy and style for sharing the content. Also sharing those content on regular basis is a good practice. If you are in those people who thinks email marketing is dead concept, then sir/ma’am, you are wrong. Emails are still a powerful source of traffic. But doing email marketing in smart way is very important. For example, if you have added a plugin which sends an email notification whenever you publish a content, then go and review that promotion email. If that email includes you whole post, that email is worthless. Why worthless? It’s common sense thing. If I can read your whole blog post in my inbox then why I will visit your website? Best thing to put the brief basic idea of your post in the email, with the link of your post and some link to share that post. That’s it. If you can spend some amount, like two cups of coffee, then you should try to advertise your content on Facebook. Advertising on face is comparatively very cheap, near about the price of two cups of coffee. And it’s a reasonable price that anyone can afford. Advertising on Facebook have some advantage like you get new visitors via that post. These visitors may like your page on Facebook, this will result that next time you will post anything they will be notified and visit to your blog. But make sure you have created your Facebook page for this. Here is a nice walk through on making Facebook pages. When you write any new content, in some way that is related to other contents you have published on your blog. Things are always related to each other. Giving links to your old content will increase user engagement on your website and they will visit other pages of your blog via these links. Find appropriate places for giving link. For example, in above point I have given link to my old post on creating Facebook page. Yes, it’s not end. Internet is very dynamic place. Technologies come and go. Near about in every two years we see some dramatic changes. These changes affect the marketing strategy. But here, on this page, we always update the new working concepts of content marketing. Follow these points and I am sure you will get very positive results. Siddharth is a programmer, blogger and learner. He loves to read and write about programming, education, new technologies and financial stuffs. He loves to do new experiments and reading history books.